Fly across this country from coast to coast or border to border, and you will see a wonderful variety of climates. Places where it’s always cool, or always warm, or always green, or always brown. One of the things I love about Pennsylvania is the green that we have three seasons of the year. Winter can be mostly grey and brown, but when it snows it’s glistening white for a few days. I think it is only as we accumulate some years in our lives that we can begin to fully understand this famous Bible verse. Farmers probably get it before anyone else does. They understand that you have to plow, plant, cultivate, reap, and store all in the turning of the seasons. If you rush or delay, your crop won’t be as plentiful. So it is in our lives. Childhood is the time to learn and grow. In the teens, we should begin to work, increase in wisdom, stature, and favor with God and man. In young adulthood, we focus on career and the establishment of our own families; in old age, should nothing take us to heaven too soon, we live to reap the rewards of our lives–grandchildren, family, friends, and a time to rest. The same happens spiritually. We’re newly saved; we grow, learn, increase in wisdom and knowledge; we reach out to others, planting the seed of the gospel; if we persist, we have spiritual children. We understand God’s Word more clearly every year. It permeates our lives, our hearts and minds, and gives grace and wisdom to our thoughts and words. We begin to appreciate the beauty in the worn, wrinkled faces of the elders in our lives if they have invested time in prayer, Bible study, and service. Just as the seasons of the year change, so do the seasons of our lives. There is beauty in each one. In the Millenial Kingdom, the whole earth will be at peace. 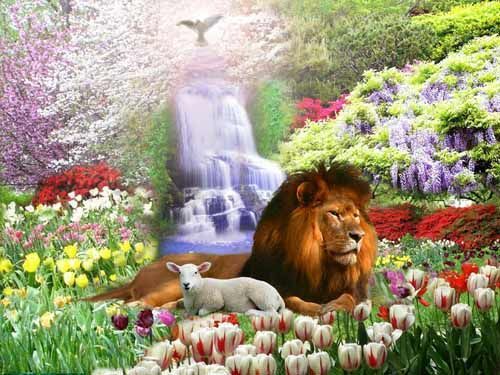 Animals will be at peace with one another, and with mankind; people will be at peace with one another. This is what happens when the Spirit of Jehovah permeates His creation. The emphasis in these verses is on the fall of the rebuilt Babylon. It will exist no more. In verse 8, the reference to the fir (cypress) trees and the cedars, is to be taken literally. The Chaldeans had cut down large parts of the forest to make use of the timber for rebuilding. I’ve heard lots of jokes about “no feller is coming up against us,” but it’s actually a reference to those who cut down, or fell, trees. A feller of that time would be called a lumberjack in America today. The point is that even the forests are finally at rest, with no woodsman coming with an ax or a saw to cut down the trees. We’ll look at the next three verses on Monday. They’re important, and will take some close examination. 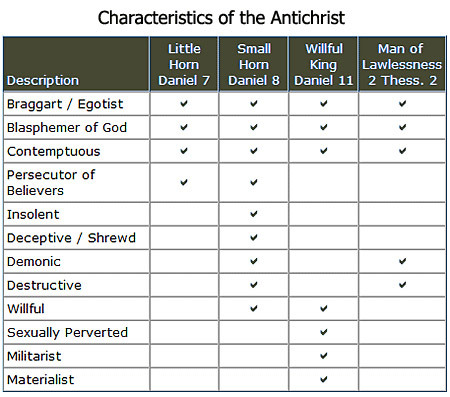 So many have tried to identify the Antichrist. So many have been wrong. We don’t know who this horrible person will be; we only know what he will be, and we know he will have authority over the entire world for a time. But when that time is over, He will be defeated. A staff and a sceptre are symbols of power and authority. Antichrist will use his authority to persecute everyone, but especially Jews and Christians. When his time is over, however, he who was at first worshiped and held above God Himself will not be saved from his doom. Once his evil nature is fully revealed, no one at all, not even his closest associates, will try to defend him. He will stand alone and hopeless before Almighty God. 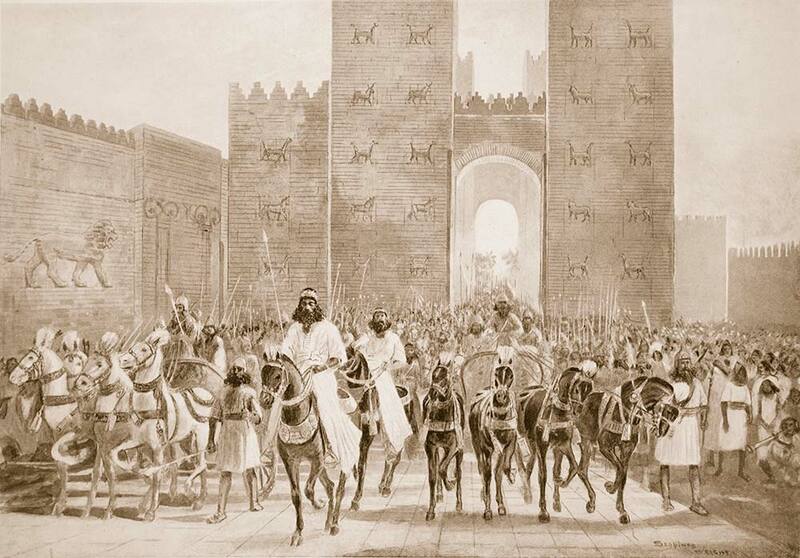 Babylon was a wondrous sight! I don’t think we can imagine how truly beautiful it was, how wealthy, how powerful. It was an exciting place to live–unless you were a captive there. Then you saw the corruption behind the outer beauty, because Babylon was a city full of idolatry and unspeakable sin. All of that is going to be destroyed; Babylon will fall. This verse is the beginning of a song of triumph that Millenial Israel will sing at the fall of Antichrist and the destruction of Babylon. Reference ch. 14: 4-23; 13: 19. The next section of Isaiah 14 should really be studied with no interruption, so I’m going to put this blog on hold until sometime next week, Tuesday or Wednesday. Terry and I will be flying out to California to help my son and his bride-to-be to celebrate their wedding on Sunday. I think I’m going to leave my electronics at home, except for my phone. I’ll need that for taking some photos. Writing my two blogs nearly every day has become such a habit. I’m surprised at how much of a struggle it is for me to step away for several days. Maybe that’s a clear sign that it’s time to take a little break. Wishing you all a wonderful weekend as we enjoy this lovely spring weather, and I’ll see you next week. There will be peace. Israel will be done with the arduous cycle of disobedience, punishment, and restoration. Her enemies will be finally defeated, and there will be peace. I love the promises of this passage. The Day of the Lord will be one of mercy, grace, and victory for His people. 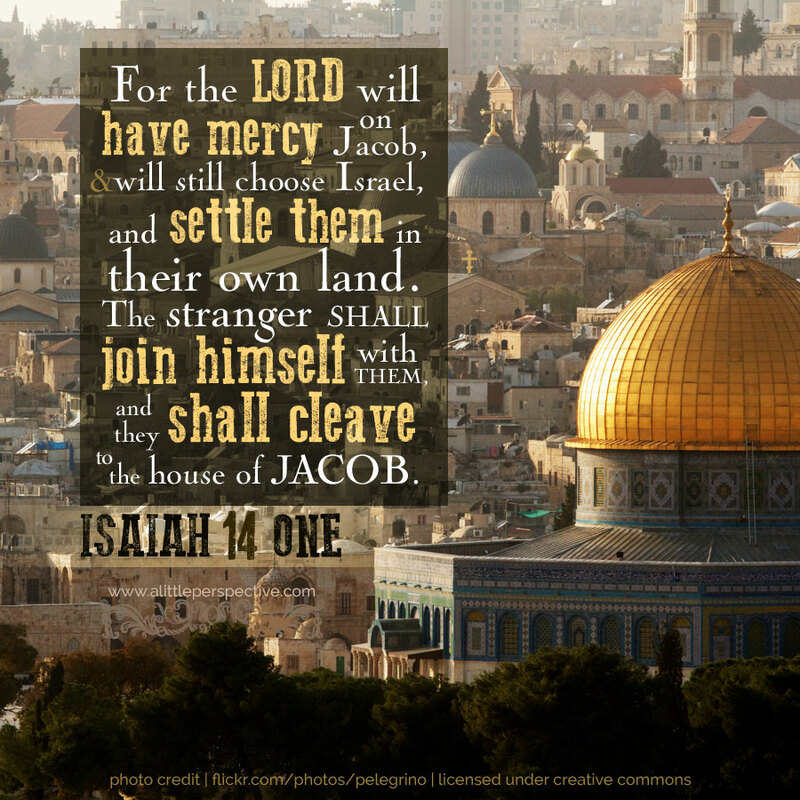 The Gentiles who survive God’s judgment will help Israel to return to her own country, and will remain there themselves as servants in the households of those who were once taken captive by their oppressors. 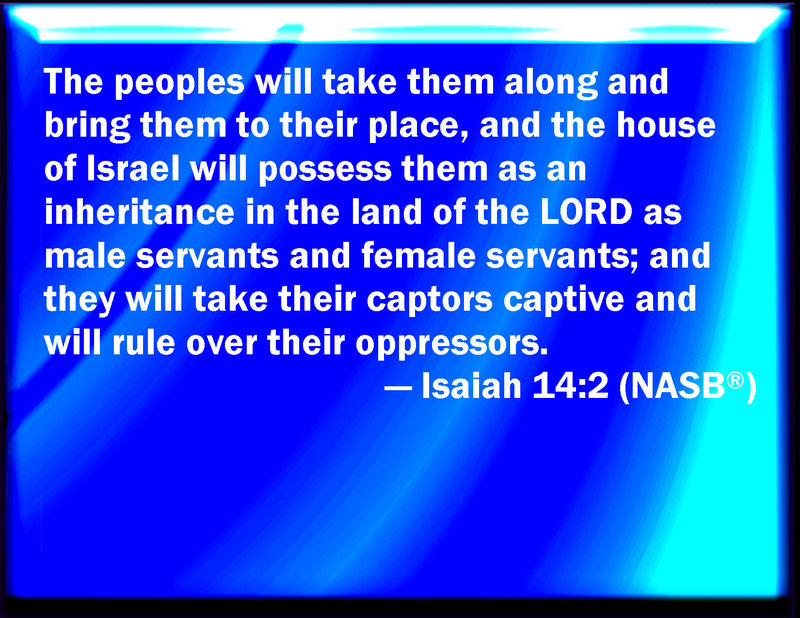 What an inflammatory prophecy this must be for those who hate Israel, wanting nothing more than to wipe that nation from the face of the earth and from the annals of history. That hatred has existed since Abraham and Sarah thought they needed to help God fulfill His promise to them: Sarah gave her maid to Abraham, and Ishmael was born. He was NOT the son of the promise. Half-brother to Isaac, who was younger, Ishmael became the father of what we now identify as the Arabian races. The enmity between Isaac’s seed, the Jews, and Ishmael’s seed, the Arabs, has never been resolved. When we decide that God needs a little nudge, that we can help Him fulfill His plans, we always mess it up. We need to learn to let God be God. It will be resolved, though, when Jesus comes to establish His kingdom for 1000 years. There will finally be peace in the Middle East. Peace will not exist because of diplomacy or any man-made treaties, but because Jesus will reign. It will be a totalitarian government.